If your problem is color fading, you should be looking for swimsuits that have a high polyester content. 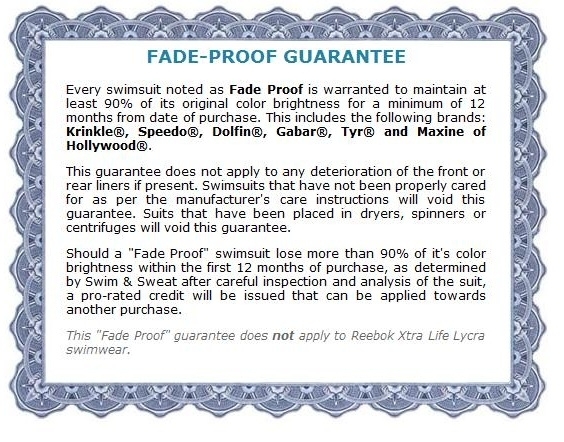 Swimsuits made of 100% polyester should retain their color for at least a year of regular use, and as much as 2 years depending on frequency of wear. 100% polyester suits are called chlorine proof for this reason. Chlorine proof swimsuits also tend to keep their shape because polyester isn't destroyed by chlorine like nylon or Spandex, which is the most common swimsuit material. contain no elastane fibers. The only drawback to chlorine proof swimwear is that it has less stretch and thus provides a tighter fit that some women find constricting. To get a looser, more comfortable fit, you may want to order one to two sizes larger than normal. This will give you a few inches of extra room. Some suits are called chlorine resistant because the Lycra® is specially developed to last longer than conventional swimwear. These fabrics include Xtra Life Lycra®. They are the least chlorine resistant suits that we offer and we do not recommend them for frequent pool users. How about the best of both worlds? Some swimwear manufacturers use a high polyester content but blend in a little bit of Lycra® for an easier fit.